The Kawai-EX Pro sample Library is a fabulous, powerfull and bright 9-foot (276cm) KAWAI EX concert grand piano that used to be in the Kennedy center in Washington DC. We worked closely with Lance Herring on this library (this is our second attempt after the AcademicGrand) and decided to give our project a new dimension, we carefully recorded this extraordinary instrument with 3 microphone pairs and state of the art Gear to try and recreate how powerfull and precise this instrument can be. 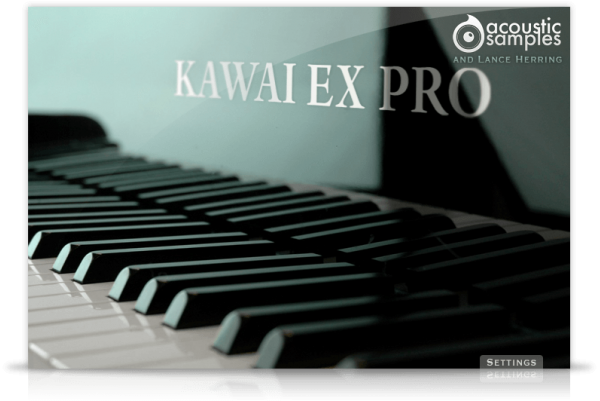 The Kawai EX PRO is now in V3 and includes many new features to make it one of the most complete pianos on the market. 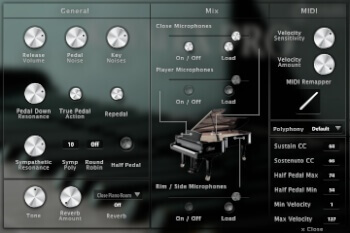 Each feature is detailed below and of course it still contains the features of the previous versions like the release volume, pedal noise and key noise. The release Volume: the sound produced when you release a key if a note was going on. The Key Noises: the sound produced when you release a key and no corresponding sustain was played. The Pedal Noise: the sound produced when you press or release the pedal, it adds a lot to the realism. The Tone: a simple way to make the piano sound brighter or darker. 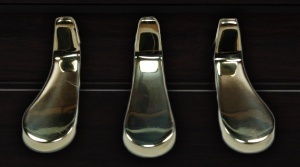 The sostenuto CC, also called the middle pedal. You can sustain selected notes, while other notes remain unaffected. The polyphony. If you lower the buffer or simply want to be light on CPU, then increase or lower this value. The Reverb. We use a convolution reverb and you can adjust the dry and wet parts separately as well as choose from a large selection of high quality Impulse Responses. Round Robin. We added a software round robin feature for the users that need to play repetitive pieces. The Close position with a pair of microphones close to the strings inside the piano to provide deep bass and rich resonances. The Player position with a pair of microphones next to the head of the piano player to really get the feeling of being in front of the piano. The Rim position with a pair of microphones at the side of the piano to give more of a soloist playing with a piano perspective. You can enable / disable, load / unload and mix each microphone position separately to get exactly the sound you want. On / Off: You can easily enable or disable each microphone position. Load: You can load / unload the samples of each microphone position. This saves Ram usage if you only use one position. Of course the controls are greyed out when the samples are unloaded. The resonances on a piano give some kind of a reverb effect when all of the strings start resonating. There are two kinds of resonances that are important to model on a piano, the pedal down resonances and the sympathetic resonances between the held notes. 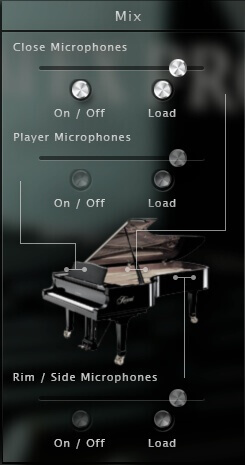 Both these effects are present in the Kawai EX PRO, you can even change the amount of each of them. Here is in detail what every control offers. Pedal Down Resonance controls the amount of the resonance when you press the sustain pedal. The True Pedal Action enables the progressive resonance on pedal down when you press a chord and press the pedal afterwards. Sympathetic Resonance controls the volume of the sympathetic resonance effect. If you want a piano that sings the harmonics, you can add a little more of that effect. 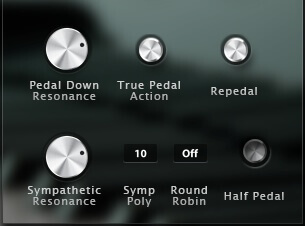 Symp Poly controls how many voices you want to allow for the sympathetic resonance effect. On a real piano, the pedal is not a simple on and off and in classical music, people often use the repedaling and half pedaling. Repedaling allows you to "restart" a chord that has been released with the pedal if the decay is not ended yet. this is especially used when you want to blend chords together. Helf Pedaling is as its name implies what happens when you play with the pedal half pressed. the decay is much longer and as the strings are not completely dampened, you hear some resonances. The half Pedal can be enabled or disabled from the interface but you can also control the size of the cc zone where the half pedal effect will occur. Half pedal min and max are the minimum and maximum values of the sustain pedal cc. We added a few midi controls to the older version. The sostenuto and sustain CC can be changed in case you want for example use an expression pedal instead of a regular on off pedal. You can also change the Midi curve, the dynamics and the velocity response to really adjust the library to your liking, keyboard and playing style. The velocity Sensitivity controls the volume curve, so how easily you get to a high volume, but the lowest and highest volumes stays the same. The velocity amount controls the dynamics, so the minimum volume associated with the lowest velocity. 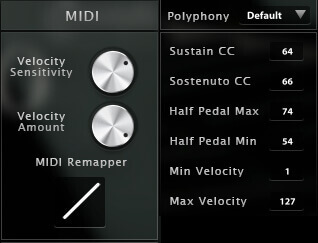 The MIDI remapper controls the mapping, so which velocity layer corrsponds to which velocity imput. The Min and Max Velocity are simply the minimum and maximum velocity that you will have to play to hear the piano. The Sustain CC is by default at 64 but can be changed to any other controller if you need to. The Sostenuto CC is by default at 66 but can be changed to any other controller if you need to. 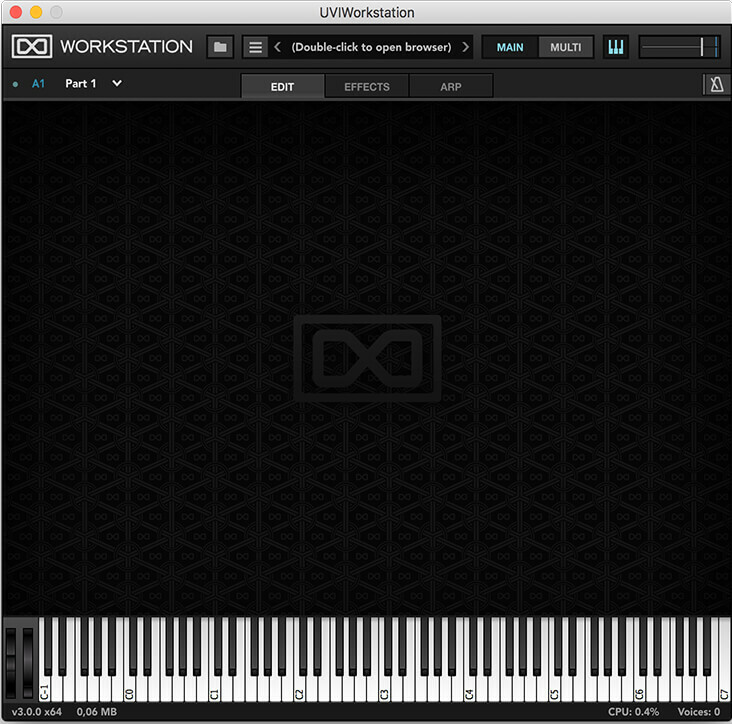 KAWAI-EX PRO comes with its own sample player, the UVI Workstation 3 (requires v3.0.0 or later). 10.9Gb uncompressed, 2.15Gb compressed in lossless flac format, around 5000 samples. 3 microphone positions that you can mix from the interface. 5 Velocity layers for the sustain (5 on pedal up and 5 on pedal down). 3 sets of 5 Velocities for the release, one for different sustain lenght (staccato). I have only recently got into making music with a Macbook Pro, having always previously been a hardware user. I was quite disappointed with the pianos that came with Komplete 9 - really thin and lacking in dynamic range (particularly in comparison to the pianos on my Yamaha S90ES). The ones that came with Logic Pro X and Mainstage 3 were also fairly uninspiring. I thought I had made a bad mistake and was thinking about getting rid of the computer gear! This superb grand has changed my mind! It's really playable, and has plenty of body and dynamics - highly recommended!